I mentioned that I lugged some fresh sauerkraut back from Germany. I was pleased at the weekend to wander into our local Polish shop to find a fridge full of fresh sauerkraut – well, I was glad to see it there but it did make me slightly regret my efforts in Germany! 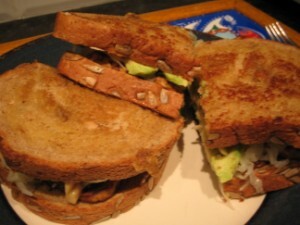 Tonight I used it to good effect with tempeh reuben sandwich from VWAV. American sandwiches are TOTALLY different from sandwiches we get in England. I was very pleasantly exposed to American sandwiches at Chicago Diner over Summer. One night I had the Dagwood and another night I had the Reuben. Both were absolutely stunning. They were certainly main meals – extremely filling, had to be eaten with a knife and fork, and were packed full of delicious ingredients. My husband and I both laughed in a sort of hysterical way about how an American in England would react if they unknowingly ordered a sandwich and got the sad sort of offering we’d expect over here! Tonight I decided to use some of my sauerkraut to recreate the reuben, using the tempeh reuben recipe from VWAV. It was very filling indeed, and while my version was not as good as Chicago Diner’s version, I was glad I tried it. I didn’t really need it, but I made a potato smasher from Dreena Burton’s book “Eat, Drink and Be Vegan”. I only got it today but these looked really appealing and I just had one potato in to try it with. It’s basically a squashed baked potato which is allowed to get all crispy in the squashed bits. Yummy (but not on the picture). This entry was posted in Eat drink and be vegan, VWAV by efcliz. Bookmark the permalink.